Home / Store / Supplements / Minerals / Argentyn 23 (silver) 16 oz. Professional grade of silver hydrosol. Some of the many uses: Immune Building, Ear Health, Eye Health, First Aid, Mouth and Gum Health etc. Maintenance Dose: 1 teaspoon, hold under tongue for 30 seconds, swallow; take once per day. Immune Building: 1 teaspoon, hold under tongue for 30 seconds, swallow; take 3 times per day. Acute Immune Issues: 1 teaspoon, hold under tongue for 30 seconds, swallow; take 7 times per day. Chronic Immune Issues: 1 teaspoon, hold under tongue for 30 seconds, swallow; take 5 times per day. Ear Health: 1-2 dropper fulls as needed or desired. Eye Health: Use 1-2 drops every hour. Female Health: Take 2-3 ounces, hold for a couple of minutes; repeat 3 times a day. First Aid Recovery Support for Cuts, Scrapes, Bug Bites, etc. : To support the immune system, spray five to ten times; repeat 5 times per day. Gastrointestinal Health: Swallow one tablespoon directly without holding, every hour on an empty stomach until balance is restored. Intestinal Health Balance: Take 1 tablespoon of silver with 1 tablespoon of a pure aloe liquid on an empty stomach, 3 times per day. Take a probiotic at night before going to bed. This protocol could last 2-8 weeks. 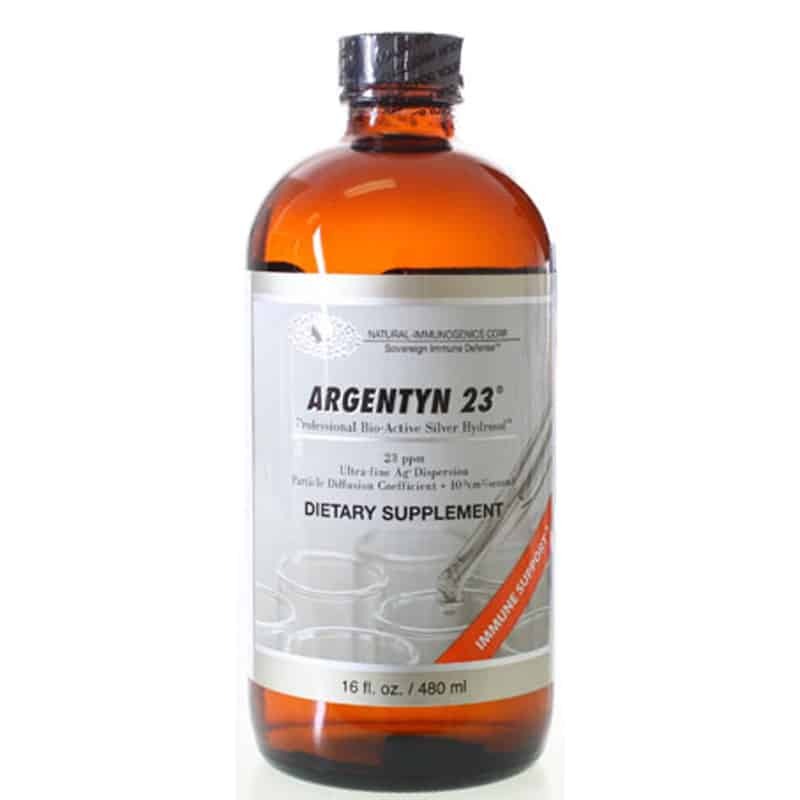 The bioavailability of Argentyn 23 is facilitated by the concurrent use of supplemental Selenium. For Healthy Water: 2 tablespoons per gallon of water; drink as needed. Traveling: 1 teaspoon before, during, and after flying for general immune support. Hold under the tongue for 30 seconds before swallowing.